Want to journey some more beyond the stars? Ok so last month I talked about Magical Shopping Arcade Abenobashi, a show that aired on TechTV’s Anime Unleashed block back around 2004-05. Now I must confess, when I first watched that show, it was only through vague means of watching late at night with the volume low and in a dark room where the TV was at. This time around, the show in question was viewed in similar terms. 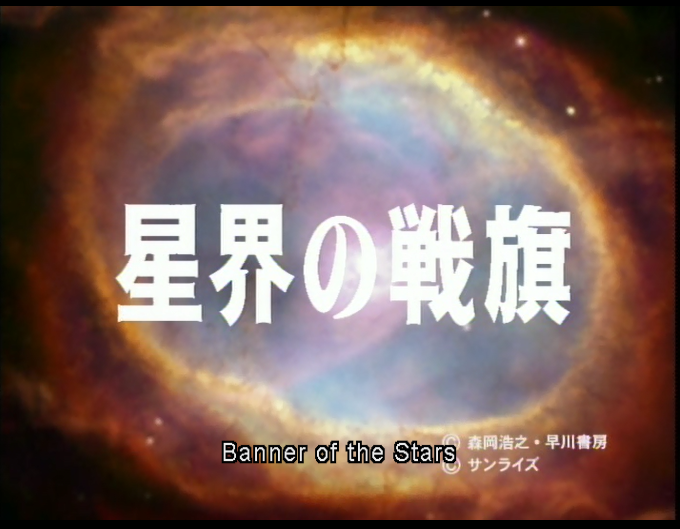 I recently watched this fully myself and that is Banner of the Stars. Continuing from Crest of the Stars, Banner of the Stars came out a year later with roughly the same production team. To be honest, Crest of the Stars is a prologue, whereas Banner I is the first part of the main story. It opens with a fierce spaceship battle capped with a neat recap of Crest of the Stars that’s quick and to the point. 3 years have past as the war between the Abh and United Mankind rages on, with no clear winner or victory in sight. Jinto and Lafiel, our two main characters, have been separated for some time. Jinto did Supply Officer Training, while Lafiel is now captain of her own ship Basroil where Jinto is her Second in Command of sorts. The relationship between the two is still full of friction. The Basroil crew has some new characters that are introduced and developed, be it the jovial Samson, stoic Sobach and the interesting Naurh. Banner tells their story with Basroil getting involved in the war effort. Now, Banner of the Stars like Crest is still very dialogue heavy. But thankfully, there are some improvements on that front here. For a start, the dialogue is much more natural, descriptive and very well done. Second the pacing is a bit improved here, as in there’s a driving plot does move along and gets things happening. It also helps that the dialogue centers around partially the relationship dynamics of the characters. As I mentioned back in Crest, Jinto and Lafiel have a very strong relationship of mutual respect and it’s nice to see that it doesn’t veer into romance though there are some moments where it nearly does. I find a part of myself in Jinto, a young man who having thrown into a situation comes to the terms with it and makes the best of that situation. The reason it doesn’t is because we are dealing with a battle warfare story. While this means lots of strategy/planning and spaceship battles, that gives some chances for some interesting characters to be introduced. For example, I like Admiral Spoor who is a very brash, cunning yet dangerous. 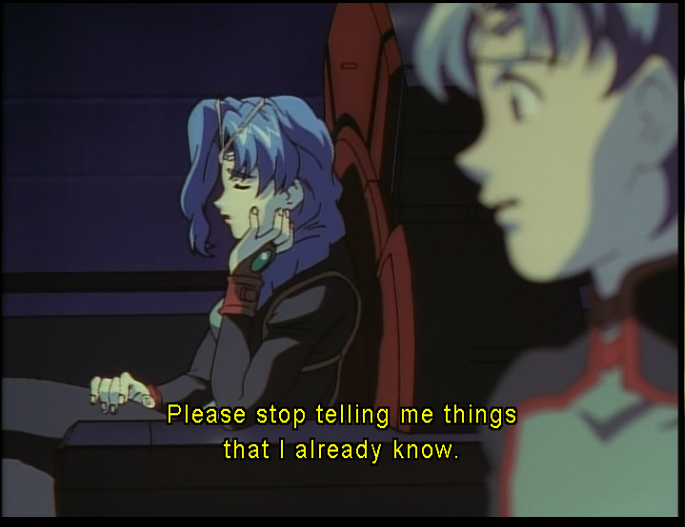 I actually like the scenes between her and the chief of staff that serves under her, very funny. Another character that caught my attention is Atosuryua, the new Squad Commander for Lafiel’s ship among others. 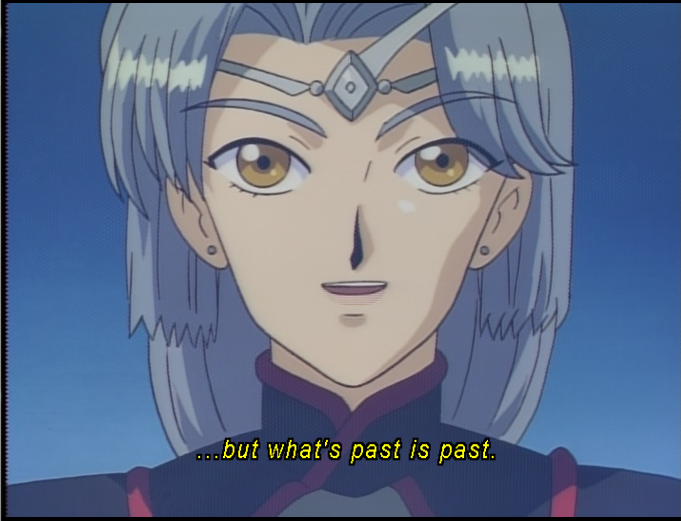 However, it turns out she has an interesting if a little oblique link to Jinto and Lafiel’s past. 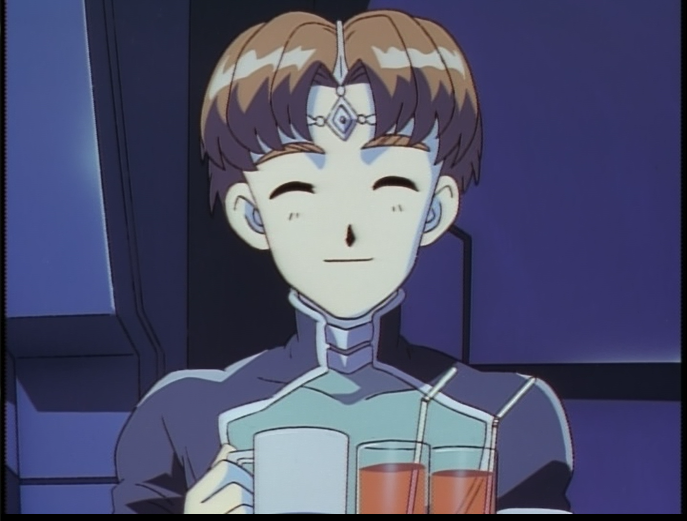 Now, the english dub for Crest was a rather weak if not middling affair. Thankfully the Banner dub is a vast improvement, in part due to different directors/writers on the dub. Jessica Yow and Matthew Erickson do a better job here as Lafiel and Jinto respectively. Bummer Jessica Yow only did this series, as she seemed to have some potential at least based on her work here. The supporting cast is a bit more lively and engaging in the dub with some highlights coming from Keith Hamill as Samson and Kris Hamill as Atosuryua, This gives us a dub that shows some really good work from a backwaters dubbing studio as Blue Water pretty much is. So Banner of the Stars is what happens when you take a solid good show and make it even better. Then again, since Banner is where the main story of the series lay, this makes some sense. 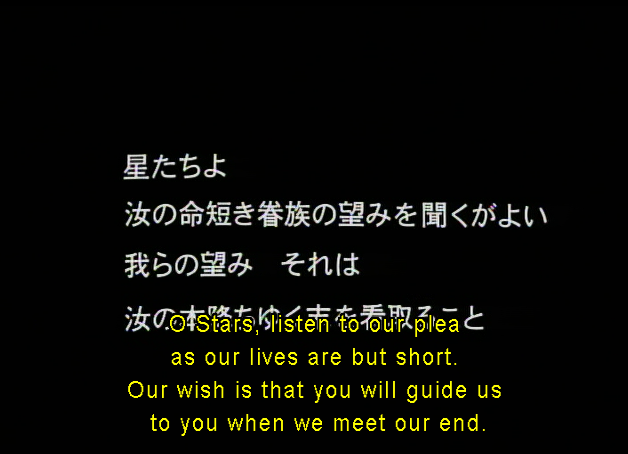 In every aspect, be it writing, characters, plot, production, music and even the English dub, Banner of the Stars just works a lot better as a whole. Of course, it ends on a bit of a cliffhanger. 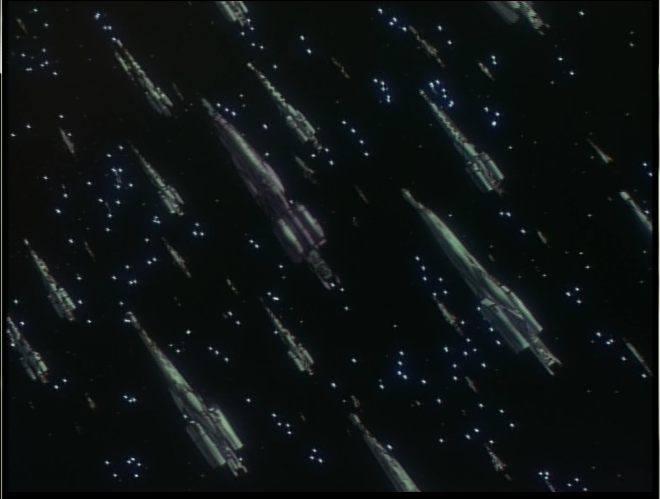 Luckily, in 2001 Banner of the Stars II would air. As for when I look at that one, well probably at some point later next year at the earliest. Well my next review is for Halloween, and I thought I’d cover something a little different…. Til next time dear readers.